The Art of Bengal show (8 January - 15 March 2014) at the Delhi Art Gallery in Mumbai presents a vast range of over 200 artworks that juxtapose art of the pre-independence India era alongside that which came to be known as the Bengal School. Spanning almost two centuries, the exhibition traces the evolution and movement from the traditional folk painting of the Kalighat Pats to early Bengal oils and other later works. The selection features some of the most respected painters of the genre, including but not limited to Ganesh Pyne, Somnath Hore, Indu Rakshit, Abanindranath Tagore, Rabindranath Tagore, Gaganendranath Tagore, Kshitindranath Majumdar and Sunil Das. Sculptures placed throughout the gallery's three levels pay homage to fine sculptors such as D.P. Roy Chowdhury, Chintamoni Kar, Prodosh Das Gupta, Bipin Behari Goswami and Sankho Chowdhury. Asit Kumar Haldar’s seminal painting Untitled (The Procession) (c. 1950) hangs above the threshold of the gallery entrance as though looking out onto the works below. Using the Japanese wash technique popular among artists of Bengal at the time, the painting gently draws the viewer into its narrative, which references a well-known story from Indian mythology. 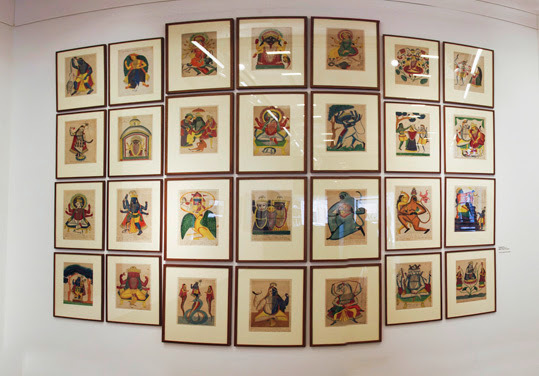 The 28 Kalighat Pats that dominate the central wall of the ground floor highlight their importance both in their own right and by way of their influence on seminal artists such as Jamini Roy whose work, particularly noteworthy of which is his painting Untitled (Santhal Dancers) (early 1960s), shares the same space. Jamini Roy, Untitled (Santhal Dancers), early 1960s. Nandalal Bose’s Untitled (Shiva Drinking World Poison) (1933) is one of the artist’s most important paintings and is iconic of 20th century Indian modern art. Interestingly the painting is one of two versions - the other can be found at the National Gallery of Modern Art. Also on the ground floor, Radha Charan Bagchi’s Satavarsha Pare (A Century Late) (1961) demands closer inspection of its intricate narrative. Nandalal Bose, Shiva Drinking World Poison (Second Version), 1933. 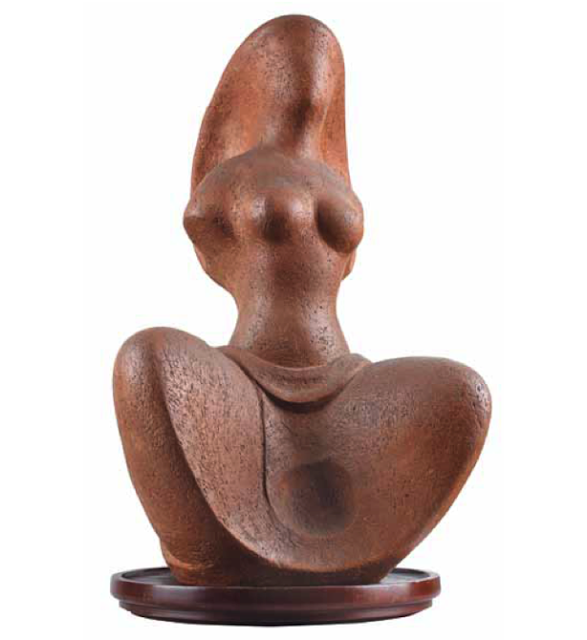 Radha Charan Bagchi, Satavarsha Pare (A Century Later), 1961. 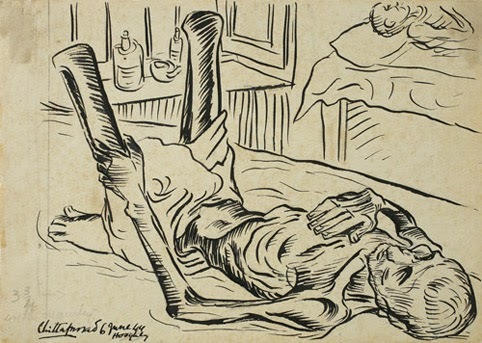 Lining the staircase walls, brush, pen and ink sketches by the passionate communist painter Chittaprosad portray the horrors and strong political machinations that surrounded the Bengal famine of 1943-1944. Chittaprosad’s drawings and reports were published in People’s War, and culminated in his publication Hungry Bengal, which was consequently destroyed by the British. Only one copy survived and is now part of the Delhi Art Gallery archives. Biren De’s transcendental and somewhat sublime tantric paintings are located on the first floor as are the haunting works by Bikash Bhattacharjee; his Untitled (Ceremony) (1976) painting is particularly unsettling as it as it seems to capture something unnatural and yet sublimely beautiful in the blue-eyed gaze of the subject that seems to be obsequious, beseeching and full of pathos all at once. The exhibition also displays a vast collection of works by the Tagore family including a number of portraits by Rabindranath and Abanindranath. Particularly significant about the show is that it conceives of the art of Bengal as not just referring to work done by Bengali artists but rather those who were influenced by, and in turn, influenced the art that came out of Bengal. Examples would include the Italian painter Olinto Ghilardi, who had a deep impact on Abanindranath Tagore, the initiator of the Bengal School. Another would be Benjamin Hundson, who arrived in Calcutta as early as 1854 and lived there for eight years painting portraits, largely through commissions for royal families. Hudson’s surviving portraits include those of the Maharaja of Burdwan, the Nawab of Murshidabad and the Sinha family of Paikpara. 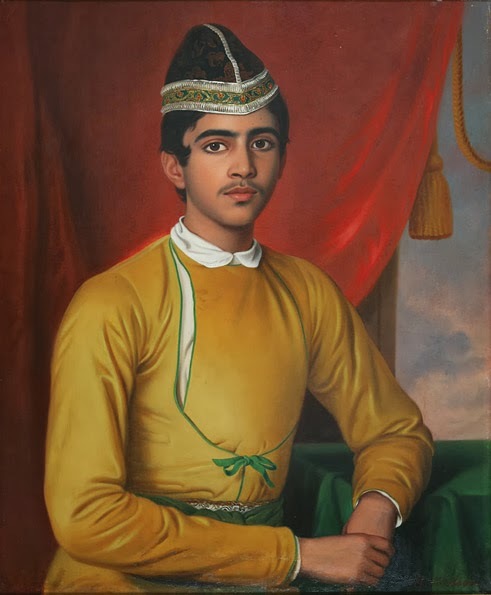 At Delhi Art Gallery, Hudson’s Untitled (Portrait of Bonsha Gopal Nandi) (1854-62) at the foot of the first floor stairwell is prototypical of fashionable European Portraiture at the time. Another such example would be the famed Kerala-born painter K. G. Subramanyan, whose Sniper and the Rain Cloud (1994) can be found on the second floor. 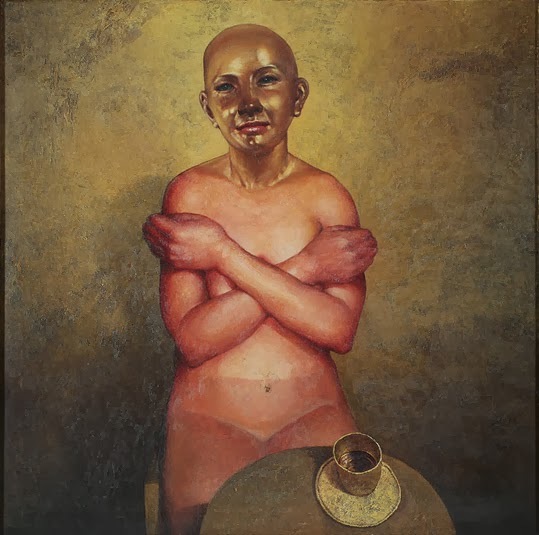 Several woodcuts and etchings by artist Haren Das are also placed on the second floor along with a very poignant Untitled (Disappointed) oil on canvas work by Jogesh Chander Seal. Benjamin Hudson Untitled (Portrait of Bonsha Gopal Nandi), c. 1854-62. The ambiental space of the topmost level of the gallery puts a number of different works on view including an impressive bronze head of Rabindranath Tagore by Sir Jacob Epstein. Overall, the show impressively manages to achieve the rare harmony between space, work and curation. Disclaimer: The author of this article is currently a Research Consultant for the Delhi Art Gallery in Mumbai.